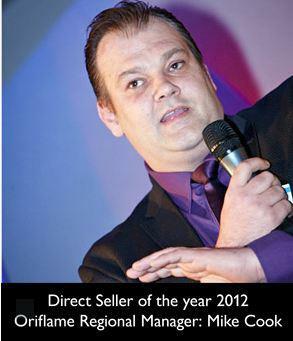 Oriflame Regional Manager ‘Mike cook’ WINS gold at the recent 2012 Direct Selling Association Awards. Mike WON the award for an outstanding individual within a member company. His all round performance was viewed as inspirational which was reflected both in his sales achievements and in his role as an Ambassador for all that is great in our industry. With a record number of nominations Oriflame’s Regional Manager Mike Cook is officially Top Direct Seller of the Year. Nominated after his long association with Oriflame as a strong seller of products – consistently being the company’s top seller with circa £50k p.a. personal sales. Mike suffers a damaged spine and is severely hampered from operation in the filed as travelling, sitting or standing in meetings is too painful for him. He got his ‘inspiration’ from his up line early last year and Mike had an ‘Epiphany’ and changed his focus from selling to building a team. Mike now has the strongest and fastest growing down line in Oriflame. Investing heavily in his IT training he has helped to deliver a ‘Hi-Tec’ solution to building and managing remote teams, using all means of modern communication, Webinars, Skype, Training videos, Blogs etc. Mike has assisted Oriflame UK Ltd in delivering a fabulous on-line library of over 100 training modules and is instrumental in building our social networking strategy. Mike’s business has more than doubled in 6 months and he is already at 100% ahead of last year’s figures so far in 2012.